One of my favourite shows on Disney Junior is Sofia the First. The kids and I always make time to sit down together and watch Sofia the First. Now some of our favourite episodes are available on DVD. 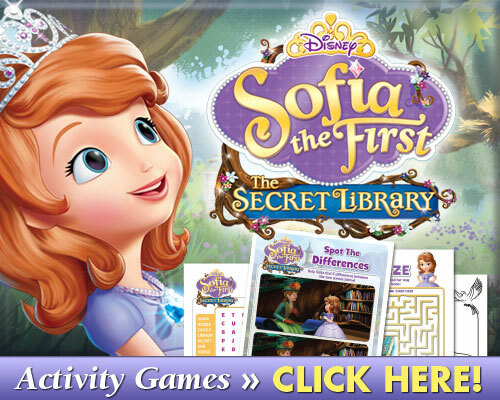 Sofia the First: The Secret Library hits shelves on June 7th. Follow along as Sofia pursues adventures that will finish the narratives, including rescuing Minimus’ brother from an evil prince and setting out on a mission to stop Miss Nettle from stealing all the beautiful snowdrop flowers from the wintery kingdom of Freezenberg. Merida from Disney•Pixar’s “Brave” and Olaf from Disney’s “Frozen” make special appearances. I am so excited to see Merida and Olaf make an appearance in these episodes! Want more Sofia the First fun? Check out these free activities now! Disney wants one of my readers to enjoy Sofia the First: The Secret Library with their little ones. To enter, tell me which Sofia the First character is your child’s favourite then fill out the Rafflecopter form below. Giveaway open to Canadian residents. Mandatory question must be answered to be eligible to win. Giveaway runs from June 7 – June 14, 2016. Void where prohibited. See my terms & conditions for full giveaway info. Sofia is my son’s favourite character. We love watching Sofia!! The Secret Library is one of my favourite episodes!! DD’s fave character is Sofia. And she is home sick today catching up on lots of episodes. My nieces favourite character is Clover. My granddaughter likes Sophie the First best. We like the Aunt that visit her ,don’t remember her name. My kids have never heard of Sofia, or if they have, they haven’t told me about it. I know that my daughter would love Sofia as she loves princesses. Sophie loves Amber the most. My niece this would be for not my son she loves Sophia . Tyler LOVES Sofia the first! His favorite character is clover. He is witty, hilarious, and always sticks by Sofia’s side! We would LOVE to have this. All my boys like princesses, and he would be beside himself to hold Sofia! My niece loves Sophie and pretends to be her all the time. My daughter is currently all about princesses, and she loves Sofia.. I believe she’s her favourite on the show. Sofia is my niece’s favourite character. Sofia is my granddaughter favourite character. Sophia is my nieces favorite character. Sofia the First: The Secret Library DVD for my niece. Who is your child’s favourite character from Sofia the First? I don’t have any children but my niece’s favourite character is Sofia. Sofia is my child’s favourite character. That would probably be Olaf.